In most documents, both on and offline, the default styling of hyperlinks (the clickable words that take you to a web page or document) are underlined and coloured blue. Most of the time this is fine, and is useful for your reader so that they can easily identify the links within your document, however there are other times when you might want to change the default styling. 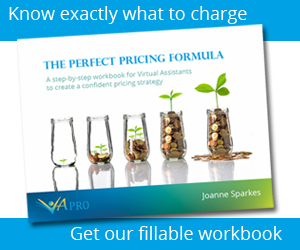 Perhaps to match the formatting of an ebook or PDF guide, or because the document is going to be printed. You can of course edit the style of a hyperlink the manual way, by highlighting the text and using the text formatting options in the toolbar to change font, underline style and colour. The issue here is that if you modify the link in any way, or click on it, then the formatting will change. which is no good at all! 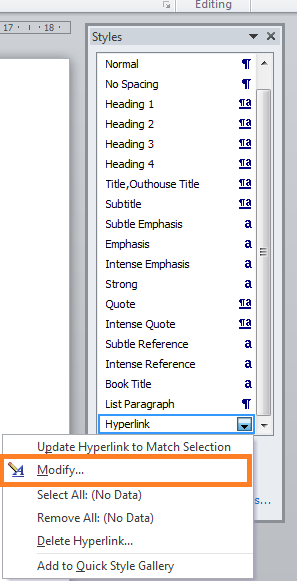 The best way to get consistency for links throughout your document is to modify the hyperlink style itself. This is done through the ‘styles’ group in the main ribbon. Find ‘hyperlink‘ in the list of styles displayed, click the drop down arrow to show more options and select ‘modify‘. 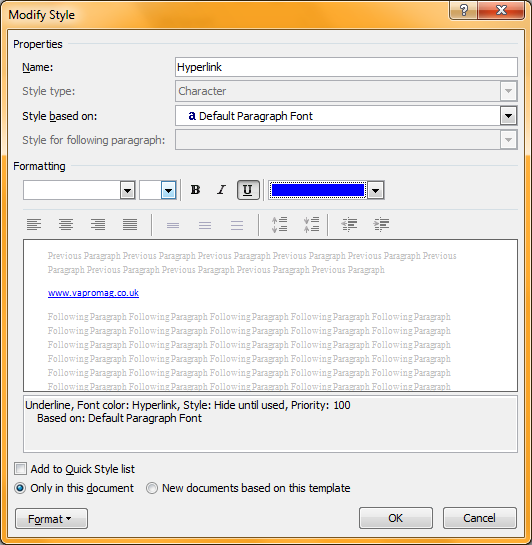 You’ll then see the modify styles box, where you can change all sorts of options – font, colour, underlining and more! Make your changes as you like. You can see in the example below I’ve changed the colour and font of my links so that they are bigger than the rest of my text.